Austrian contractor Strabag has scooped the US$788M contract to construct a 20km long, 9.9m diameter twin-tube section of the 32km long Koralm Rail Tunnel in Austria. The contract, awarded by client, ÖBB Infrastruktur AG, is the largest ever to be awarded in the country. Work will begin work in early 2011 with completion scheduled on this main section by late 2018. “We are currently finishing work on the Gotthard Base Tunnel in Switzerland. It is wonderful that we now have the opportunity to again deploy our decades of expertise in tunnelling in our home country of Austria,” says Hans Peter Haselsteiner, CEO of STRABAG SE. The Koralm Tunnel is the main section of the new Koralm railway link to be built between Graz and Klagenfurt and makes up an important section of the Baltic-Adriatic axis of TEN Corridor No. 23 between Gdańsk, Warsaw, Vienna and Bologna. 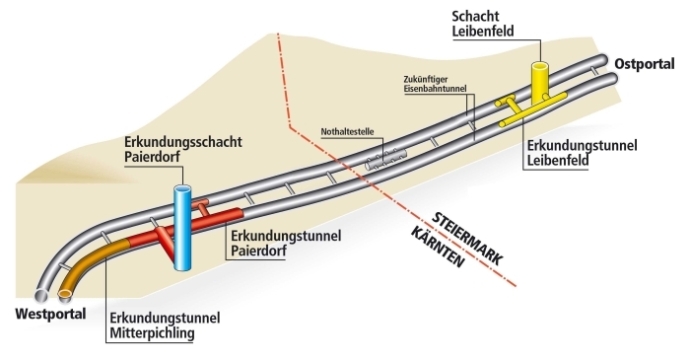 Upon completion, the Koralm Tunnel will be 32.5km long, making it the longest railway tunnel in Austria and one of the longest in the world.